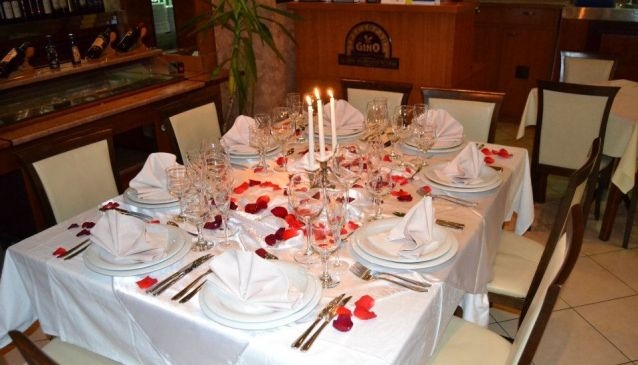 Restaurant Gino is located in the City Shopping Mall (Gradski Trgovski Centar) in Skopje and is one of the most popular Italian restaurants in the country. Modernly decorated with professional and kind services it is a magnet for both locals and tourists. The menu offers a wide array of Italian dishes including house specialities. The restaurant has an open and closed terraces that during the warmer months offer a great view towards the nearby park and a great environment to enjoy their delicacies. Nearby you can easily enjoy the many attractions that the city of Skopje has to offer such as the Macedonia Square, Stone Bridge, Museum of the Macedonian Struggle and many more. The city cetnre is always buzzing with people and tourists. Since Gino Restaurant is part of the City Sopping Mall you can explore the neverending halls of shops and simply visit as part of your shopping day in the capital.